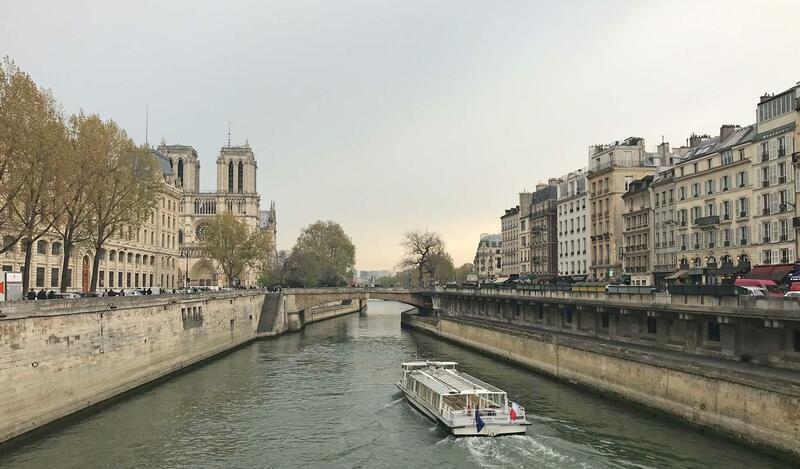 Overlooking the river Seine and the Notre Dame of Paris, this primely located duplex apartment with a double reception room (8 m / 26.2ft high ceiling - bow window) offers one of the best views of Paris. The apartment is located on the 4th and 5th top floor of a charming co ownership building constructed in the 19th century. On the 4th floor, it comprises a small entrance, a double reception room with its panoramic view (part of the room can be closed at night to create a 2nd bedroom in necessary), a small dining room facing the famous Ile de la Cité (one of the 2 natural islands on the Seine River), and a kitchen in the back of the flat. On the 5th floor, there is a large bedroom that is accessible through a nice staircase in the entrance, as well as a small library / office as well as a bath room with toilets and laundry room. Property exposed to sunlight all day long, wooden floor, fire places, no elevator, AC in master bedroom. Easily accessible by RER (metropolitan) to airports Roissy Charles de Gaulle (CDG) and Orly (ORY) and Gare du Nord (EUROSTAR to London). For information and viewing, please call + 33 6 20 50 14 62.